In the Pacific Northwet we idolize the sun. We don't see much of it, so when it's shining face peeks through the clouds, we totally freak out. More sunglasses are sold in the Seattle area than any other place in the country. Ha--that's because we loose them in between wearings! Anyway, this last week we've had temperatures as high as 87 degrees at our house. Wow, that's totally off the chart for this time of year! We've given up the search for the full bottle of sunscreen leftover from last summer. 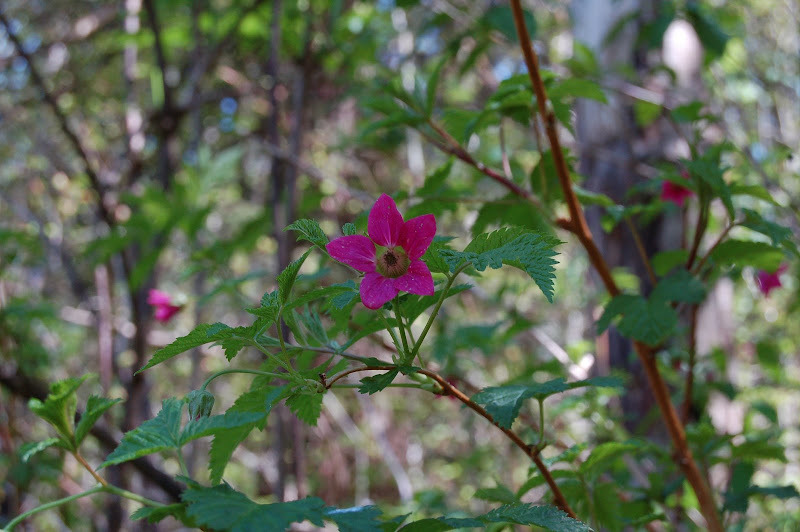 The first "heralder of spring" (heh-heh, I've always wanted to use that phrase) is the lovely salmon berry blossom. Emerging through a barrage of bright green leaves, the salmon berry is a favorite of the hummingbird. It's such a favorite the "hummers" aren't visiting my feeder much this year. I don't mind them defaulting to the salmon berry. They were made for each other. On a recent trip through the arid Columbia River Valley of Washington I found this beauty. It has a very long name, for a plant --- Arrowleaf Balsamroot. Or is it Arrowroot Balsamleaf? I like the first one better. It's a member of the sunflower family and was traditionally roasted, ground and eaten by members of the Nez Perce tribe. Sunny days outnumber those that are cloudy in the Columbia River Valley. Wind is the big weather factor there, as seen by this plant's permanent leeward lean. Now for your quiz. This is "open blog" and a correct answer achieves nothing but a broad smile. It proves an understanding of geography, botany and meteorology. Or, you're a good guesser who's playing the odds and you feel lucky with them being close to 50/50. 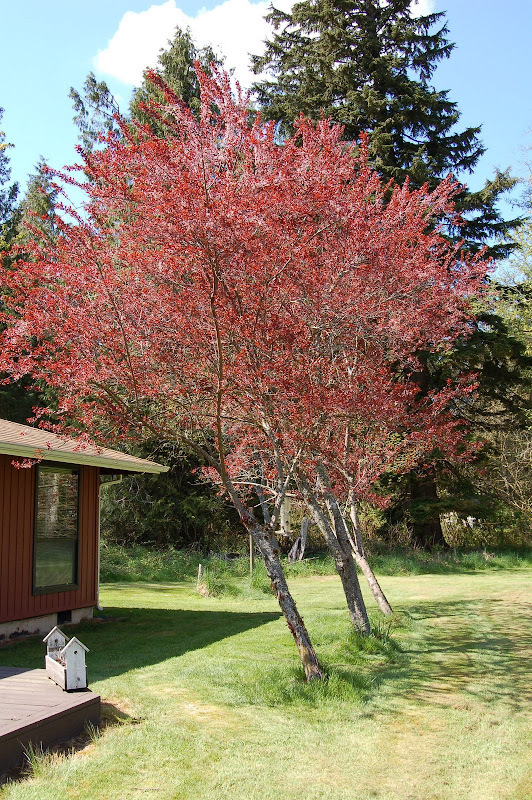 Look at the picture (below) of the sad flowering (clue) plum trees (clue) in my backyard in western (clue) Washington (clue), located in the northern hemisphere (clue). Although we have lots of wind in this part of the country (not clue), the base of the trees are not eroded (clue). The wind was calm when I shot the picture (clue). Quiz question: which compass direction is WEST? Post your answer by scrolling to the bottom of this post and answering in the form of a "comment" by clicking on "comment" (duh). Good luck and have a great weekend!